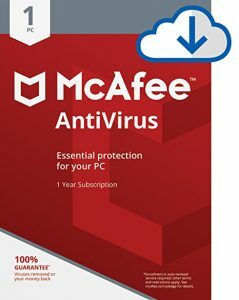 Amazon has a $0.01 for McAfee 2018 AntiVirus 1 PC. The price is right! Download away. Award-Winning Antivirus: Blocks viruses, malware, ransomware, spyware, unwanted programs, and more on your PC. McAfee WebAdvisor: Warns you about risky websites and helps prevent dangerous downloads and phishing attacks. It provides search ratings, checks to see if your firewall and antivirus are activated, scans your downloads and alerts you if there’s a known threat.